Often, up to 80% of product consumed during a sushi meal is rice. 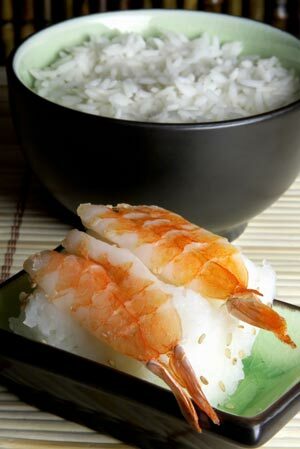 Getting your sushi rice right is a crucial element in successful sushi making at home. The proper preparation of the rice is so important that in our shop as well as most quality establishments there are chefs whose sole responsibility is to cook the rice. If you do not have a Japanese rice cooker, a heavy pot with lid is essential( I like Lagostina cookware). One secret is to always measure your ingredients carefully. Following is a basic sushi rice recipe for rolled sushi. Also, the type of rice you use is most important. We recommend the following brands: Kokuho Rose, Tamaki Gold, Tamanishiki, Nozomi and Yume. Your first step is to prepare your vinegar-water solution called tezu. Mix together 250 ml of water, 30 ml of rice vinegar (Marukan and Mitsukan are excellent) and 5 ml of salt. Wash the rice several times until the water runs fairly clear when draining. Let your wash rice strain for 30 minutes. Transfer the rice to your pot or Japanese electric rice cooker and add the measured water. For electric rice cookers, turn on and wait for rice to finish cooking. For stove top cooking heat to boiling , cover tightly and simmer at lowest heat allowing the rice to steam for 18 minutes. You must leave it covered... no peaking! Remove your pot from the heat and let stand covered for another 15 minutes. Mix the vinegar, sugar and salt together in a small saucepan. Heat the mixture until the sugar dissolves, stirring frequently. Remove from heat and let your sushi vinegar cool to room temperature. Take a wooden spatula or spoon and cut and fold the rice. Be gentle as you do not want to smash the cooked grains. Moisten your bowl with a cloth dampened with your TEZU mixture. The traditional bowl to use is the flat-bottomed wooden sushi oke or hangiri. The porous wood absorbs excess moisture and the large surface allows the rice to cool more quickly and evenly. Put the hot rice into your mixing bowl and add 1/4 of the sushi vinegar solution. Mix with a folding motion so as to not smash your perfect sushi rice. Repeat until all sushi vinegar is used. After mixing, fan [electric fan will work] the hot rice mixture for about 5 or 6 minutes in order to remove excess moisture and create a glossy shine to your rice. Your rice should have a slight chewiness and be sticky to the touch. Et Voila! Sushilinks' perfect sushi rice – ready for rolling!